In this final installment of my mini-series about venture capital, initial public offerings, and Uber, I want to start by reminding you of your prime directive as an investor: buy low, sell high. These are the four most important words in investing. They are your key to unlocking the stock market's fortunes. But that doesn't mean the share price won't be higher in the future. In fact, the best companies will almost certainly see their stock prices rise in the future. New products, rising efficiency, cost savings, more customers, price hikes... these are what you want to see from the companies you invest in. I watched the Lyft buy orders filling as soon as the stock opened on Friday, starting a little over $87. 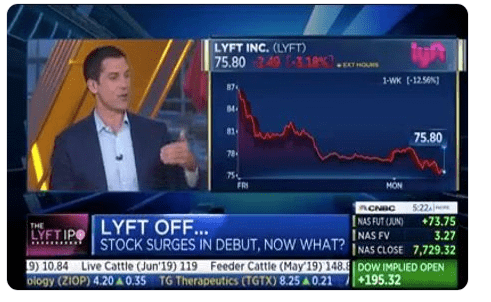 Let me tell you straight out: Buying Lyft at $87 a share is not "buying low." Because at $87 a share, Lyft is worth about $30 billion. Let's say you were in the market to buy a company. You find Lyft, which took in $2.2 billion in revenue last year and posted a net loss of $911 million. Would you really pay $30 billion for that kind of performance? When Warren Buffett buys a company, he wants the operating cash flow of that company to completely pay him back for his investment in less than 10 years. Lyft has negative cash flow of around $280 million. Even worse, Lyft burned $472 million in cash last year. Oh, and did you know that both Lyft and Uber are undercharging for rides to get market share? And they also recently cut wages for their drivers? So the question is: How long will it take for Lyft to generate $30 billion in operating cash flow? Amazing. They are actually saying that opening at $87 and closing at $78 is "soaring." Seriously? Sadly, this is where the financial media is these days. There is more institutional money (VC, endowment funds, sovereign wealth funds, hedge funds, etc. ), and there is less retail investor money, due to the post-crisis drop in individual investing. I will tell you that it's actually a good thing that CNBC has so blatantly sided with the big money against you and me. Because if there was any illusion that CNBC has your interests at heart, well, that should be pretty thoroughly shattered by now. Editor's note: Thank goodness there are still independent research firms like Angel Publishing and Wealth Daily. I know some people don't like the subscription newsletter biz, but I will tell you that it's the most honest and democratic investment business model out there. A year of my Wealth Advisory is $99, and if I don't do a good job (i.e., pick winning investments), you cancel and get a refund. The sad fact is, venture capital isn't so much about nurturing young companies anymore. It's simply about creating a narrative that will help the early investors make money. Now, that doesn't mean there won't be opportunities with IPOs. My Wealth Advisory readers have had great success with Twilio (NYSE: TWLO), which we bought shortly after it went public. The one caveat is that we all have to be more discerning about the companies that come to market. Beware the big "story" IPOs like Lyft and Uber. It's gonna be those under-the-radar stocks that have the real potential. If you're interested, pay attention to the work my colleague Monica Savaglia is doing with her IPO letter. It's good stuff. Uber thinks it's worth $120 billion, or 12 times its revenue. But it appears there are too many cooks in this one... Wealth Daily editor Briton Ryle explains why he will never buy shares of Uber. Wealth Daily editor Briton Ryle discusses equity versus capital markets, value, and stock ownership in the context of bull and bear markets and the state of the current IPO market.